Every minute of every day, we upload over 35 hours of video to YouTube, that's over 18 million hours uploaded each year. We increasingly enjoy sharing bits of life with others and the world. Whether it's a video of Grandma's 85th birthday or that dog that runs into the wall when he wakes up, your BlackBerry smartphone makes it easy to capture, preserve, and share those moments. We've covered the basics of using the video camera on your BlackBerry, no matter if you're using BlackBerry OS6 or OSFive. After you've filmed your masterpiece, what do you do with it? Does your video get moved to your computer? Perhaps you send your video to a friend's phone with BBM or as a "text" message. Some videos simply fade away; filmed and forgotten. Lost amongst a sea of ones and zeros. Bring those videos back to life. Share them on YouTube. If it was good enough for you to film, it's probably good enough for YouTube. Granted, not every video is appropriate for the video sharing site; my independent film, "10 Minutes of the View Inside My Shirt Pocket," wasn't very popular. But don't let my incomplete success dissuade you from uploading your own cinematic work. OS6 users have it easy with the ability to upload videos built right into the operating system. OSFive users don't have it quite so simple, but there are a few workarounds. 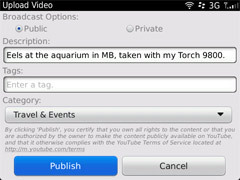 Find your video in the list of available ones on your BlackBerry. Highlight, but don't play the video. Open the menu by pressing the menu key on your BlackBerry. From the list, select send and then Upload to YouTube. 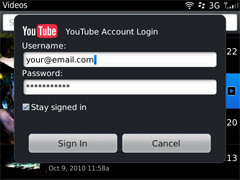 Login with your YouTube account information. If you do not have an account, you will need to create one before continuing. Give your video a name, a description, and a category. Videos can be listed as Public (everyone can see them) or Private. Private videos can only be viewed by those with access, granted to a maximum of 50 people. Your video will begin to upload. The time it takes to upload will vary depending on the size of the video and the speed of your internet connection. Uploading over 3G (mobile wireless) will take considerably longer than Wi-Fi. 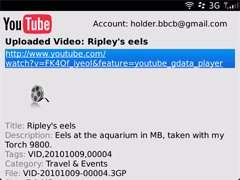 If you select Hide in Background, the upload will continue as you use your BlackBerry as normal. You can check on the status of your upload in the messages folder. Once your video is uploaded, you'll be provided a link to the video. You can use this link to share your video with the world.... or just your world. 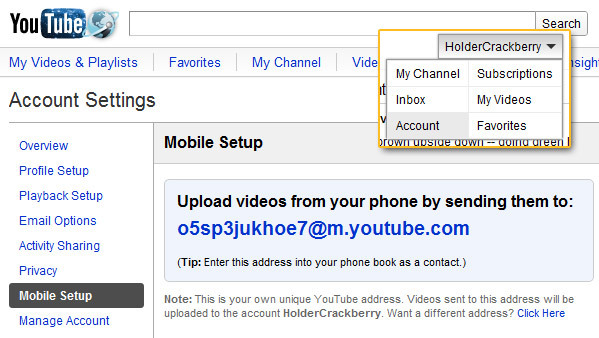 It is possible to upload a video to YouTube via email, but there is a big limitiation. In order to be emailed, the video must be less than 3 MB in size. To record a video that small, you will either need to be extemely fast on the start/pause button or change your video's resolution. You can find that setting in the options of your video camera. Before sending your video via email, you'll need to find out what your YouTube email address is; any videos sent to this address will be added to your YouTube videos. Once you've logged in, find your user name at the top right of the screen; clicking it will open the menu. Select Account. From the screen that appears, select Mobile Setup. Your email address will be displayed to the right. The 3 MB email limit is distressing; even a short video can be 5 MB or more in size. 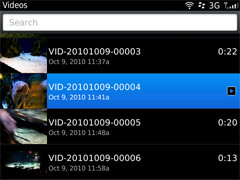 While there are a few apps out there that say they can upload videos to YouTube, none have been tested by CrackBerry.com. That's not to say there aren't decent apps out there; it's just we haven't tried them.